Remember those preserved lemons I showed you how to make last week? I’ve been scheming fun new ways to use them—cocktails, appetizers, even desserts. 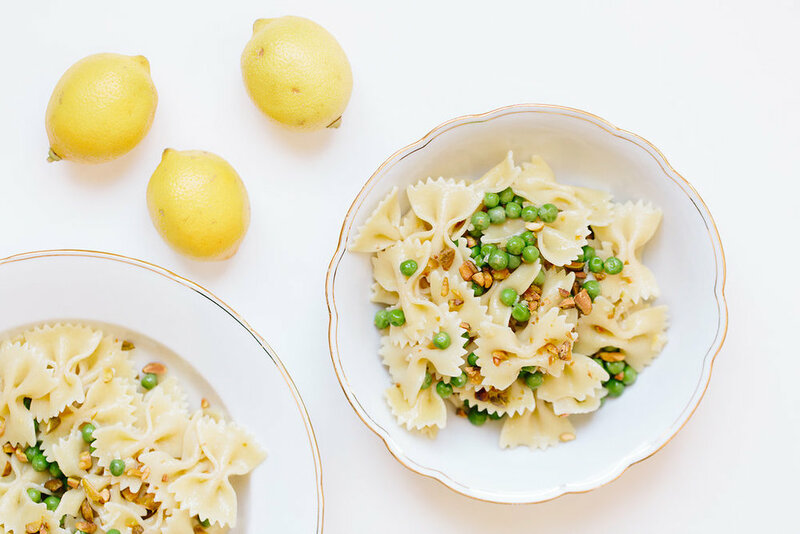 But so far, one of my favorites has been this lemony pea pasta inspired by my friend Shane, the pasta king of San Francisco. It’s light but fresh and so flavorful. Although preserved lemons are easy to make, if you’re antsy to try this recipe before your lemons are ready, look for them in a specialty food store (if you’re in San Francisco, I’ve purchased some at Rainbow Grocery). Whether you make your own pasta dough (learn how to here), or buy dried pasta, there’s one cardinal rule: don’t overcook it. Al dente means “to the tooth” or “firm to bite”. Without that subtle bite, overcooked pasta can easily resemble baby food. I typically read the package directions and set a timer for half the recommended time. Then I keep a close eye on the pasta over the next few minutes. It usually cooks much faster than the direction indicate. Bring a large pot of salted water to a boil and add the dry pasta. Cook according to package directions. Fifteen seconds before straining the pasta, add the peas to the pot, then strain the peas and pasta combination. Return peas and pasta to the pot and add the mascarpone, butter, and salt. Stir until melted. Add preserved lemons and stir. Divide pasta in individual bowls and sprinkle with pistachios before serving.